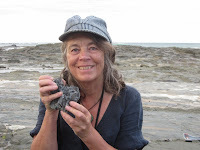 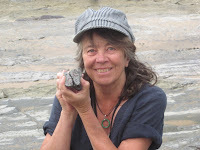 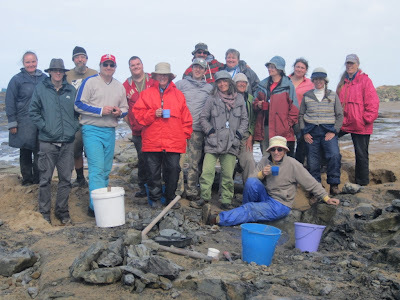 While some of the Dinosaur Dreaming crew were having great fun down in the Otways last week, Lesley was privileged to host visiting palaeontologist Paul Barrett at Museum Victoria. 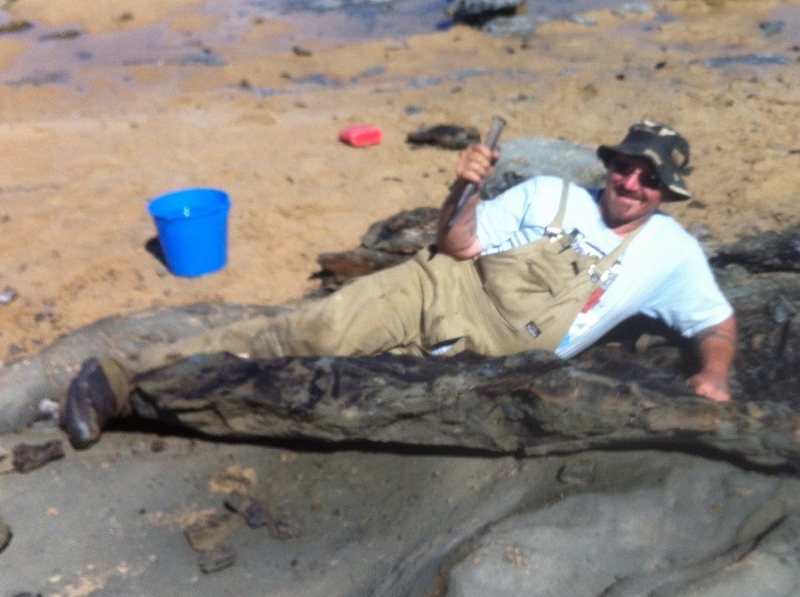 Paul is an expert on ornithischian (plant eaters) dinosaurs and hails from the Natural History Museum in London. 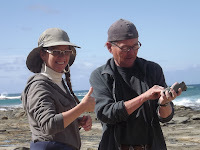 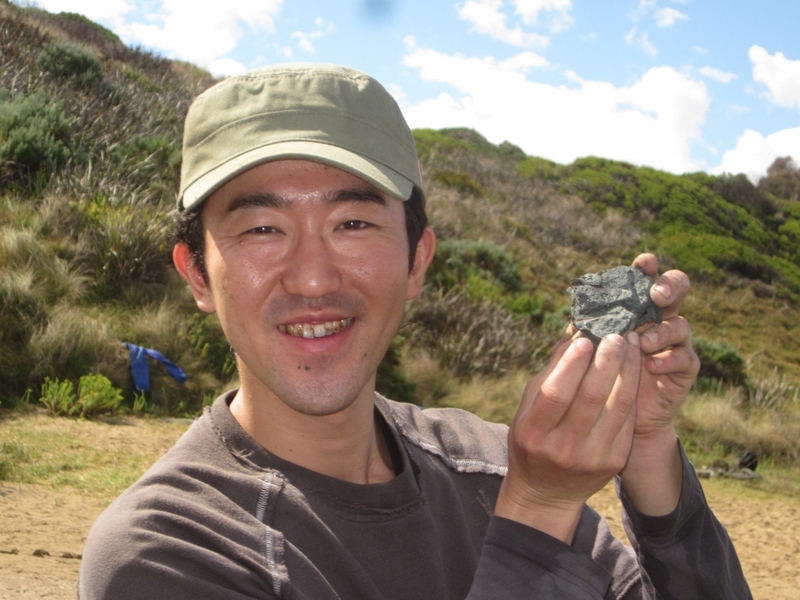 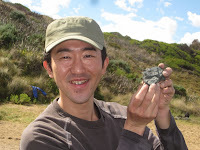 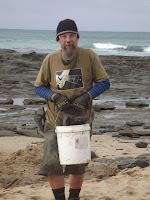 He has come to study "Noddy" our baby dinosaur from Inverloch, which was found by Mike Cleeland in 2010. 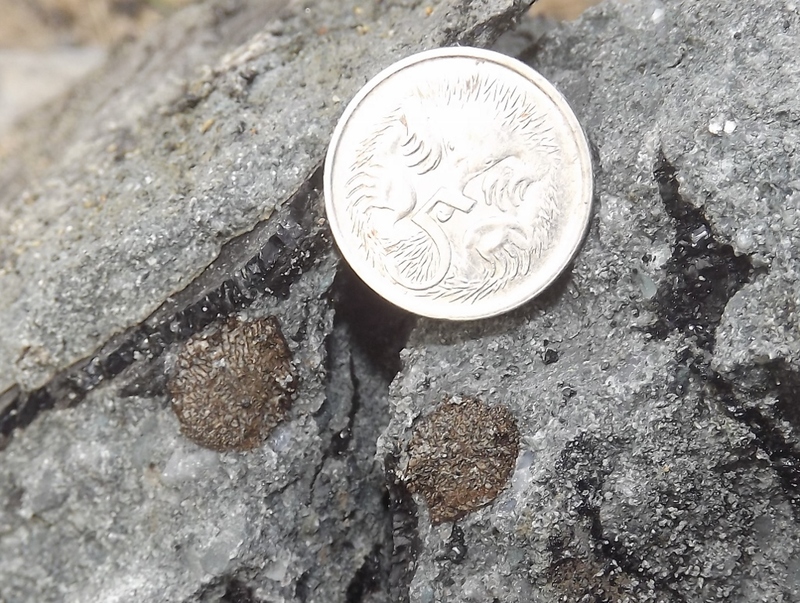 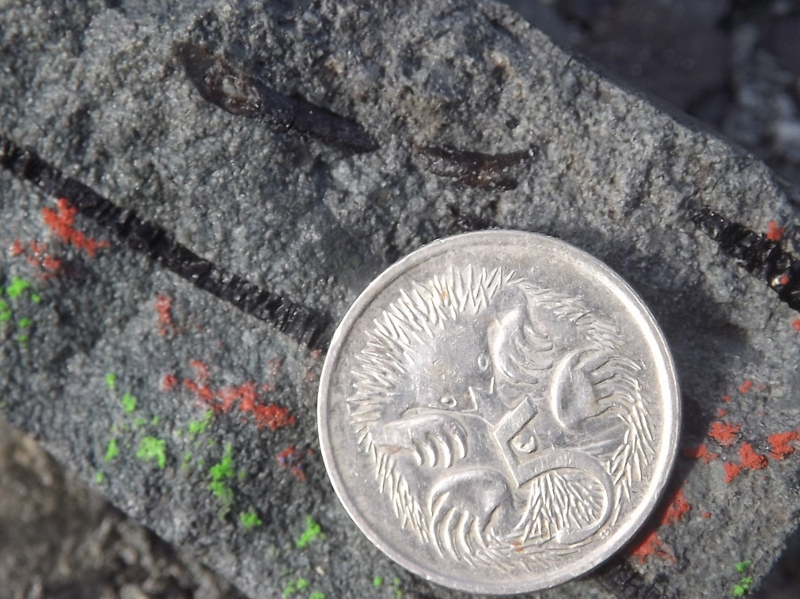 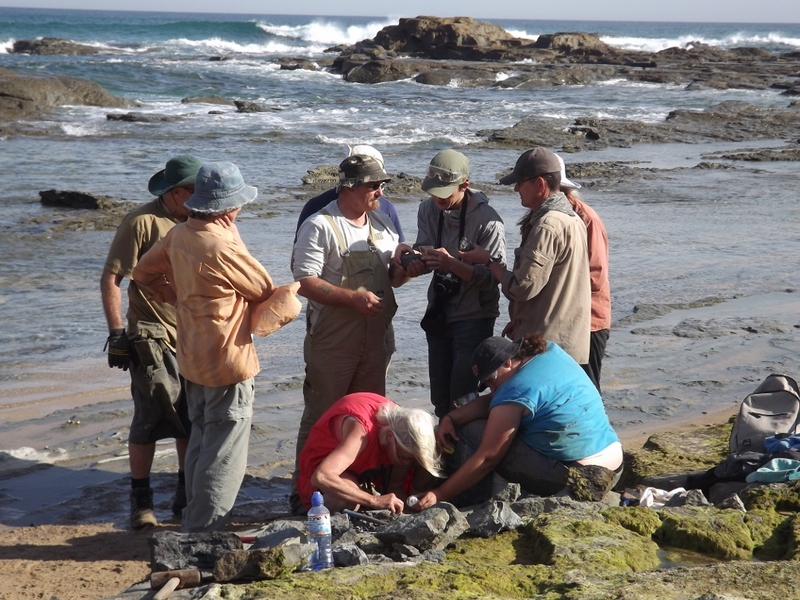 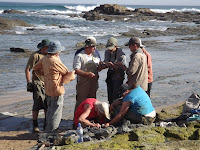 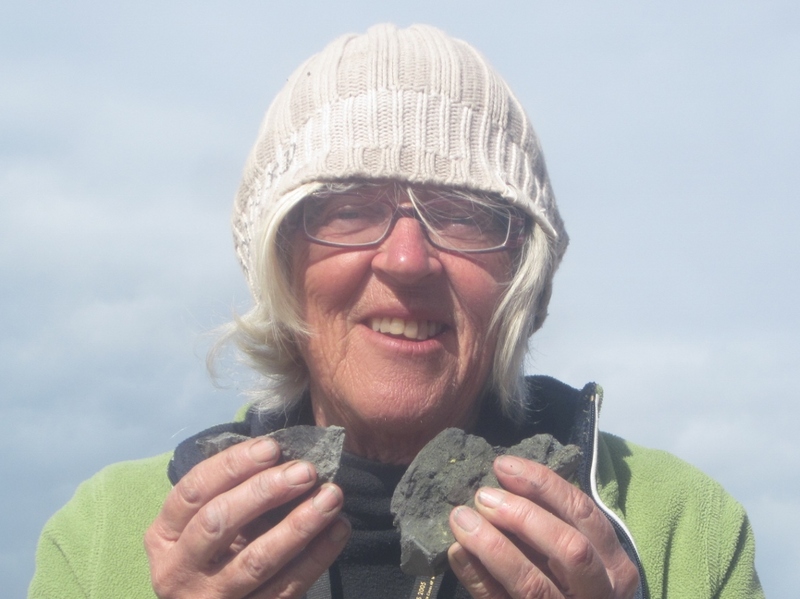 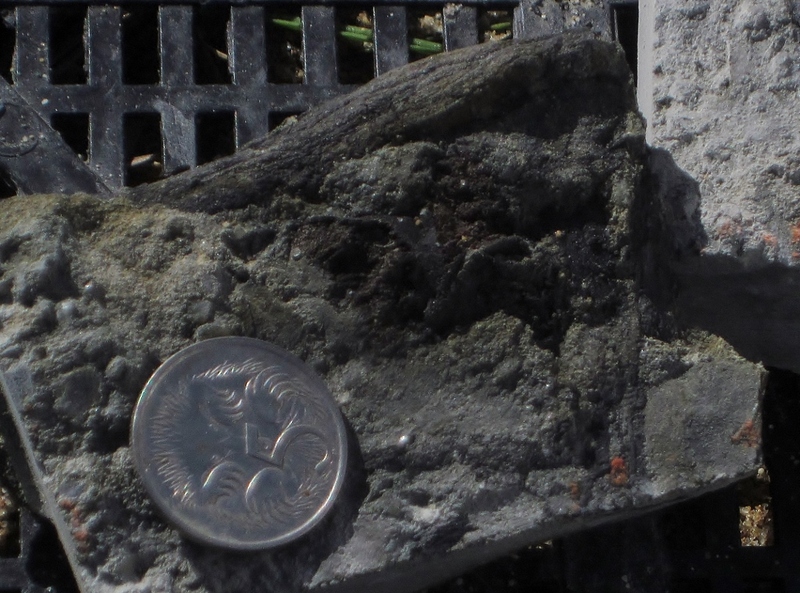 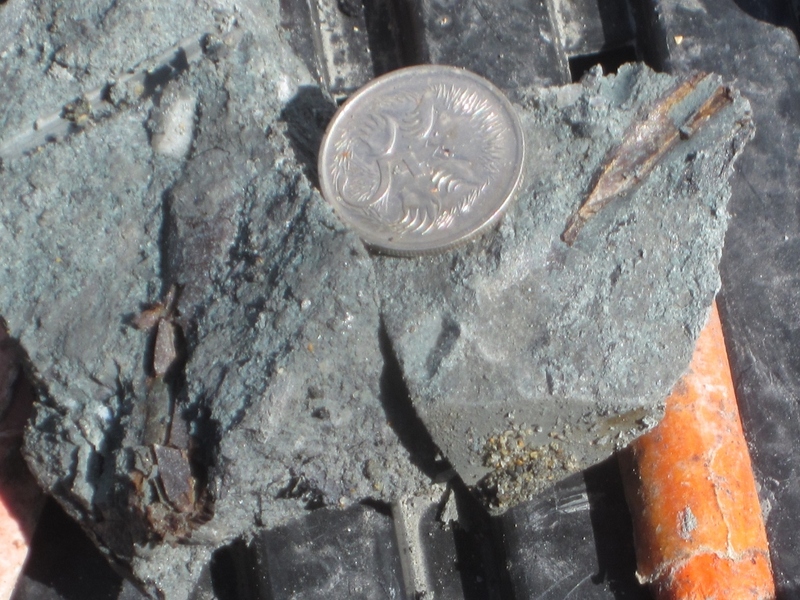 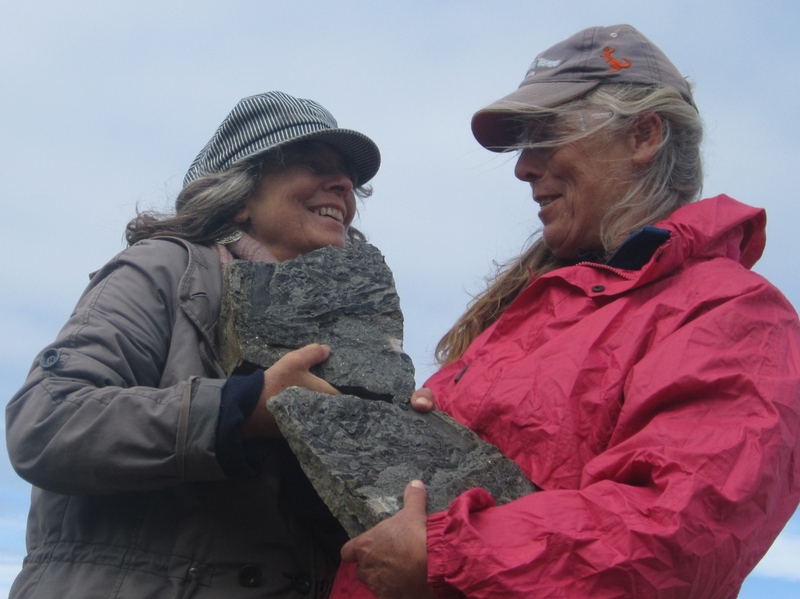 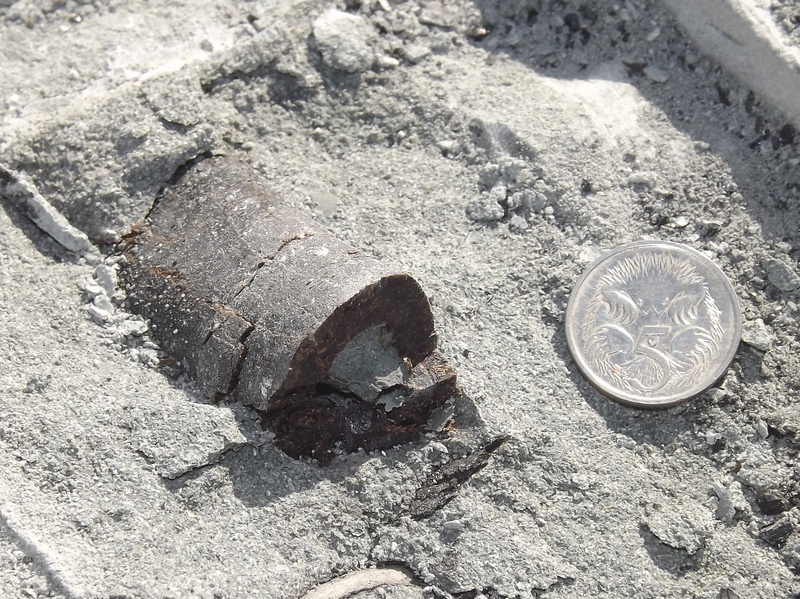 Noddy got his name because he was found in a small rock nodule or concretion on the shore platform north of the Flat Rocks site. He is the first dinosaur skeleton from the Strzelecki Group, south-east of Melbourne and only the fourth dinosaur skeleton found in Victoria, so he is very special. As well as studying Noddy, Paul also looked at the other specimens in the Early Cretaceous Vertebrate Collection and identified a number of isolated dinosaur skull elements. This new information will be added to the Museum's data base. 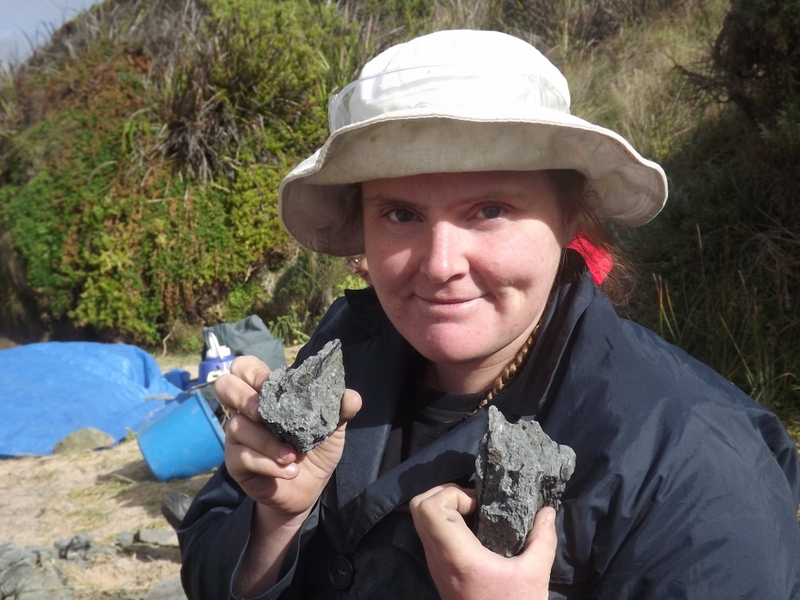 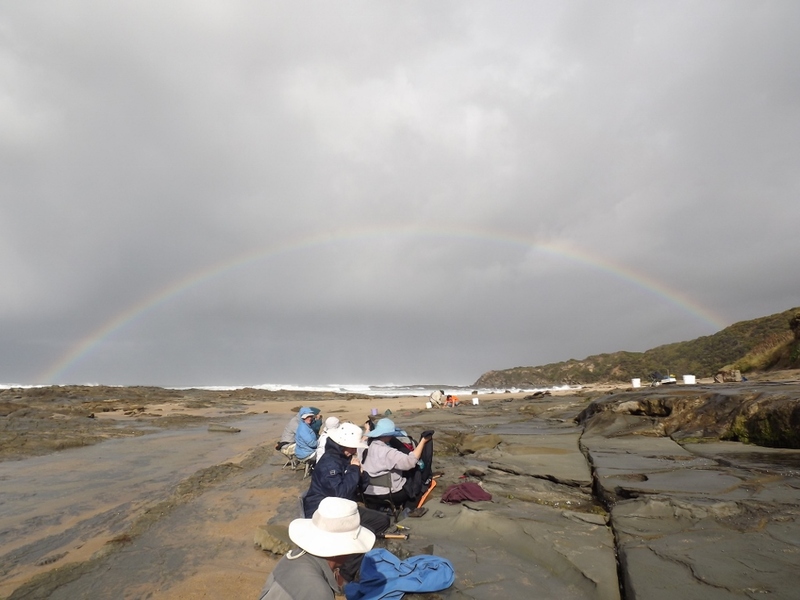 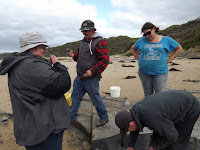 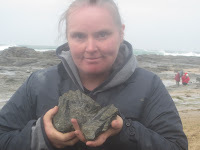 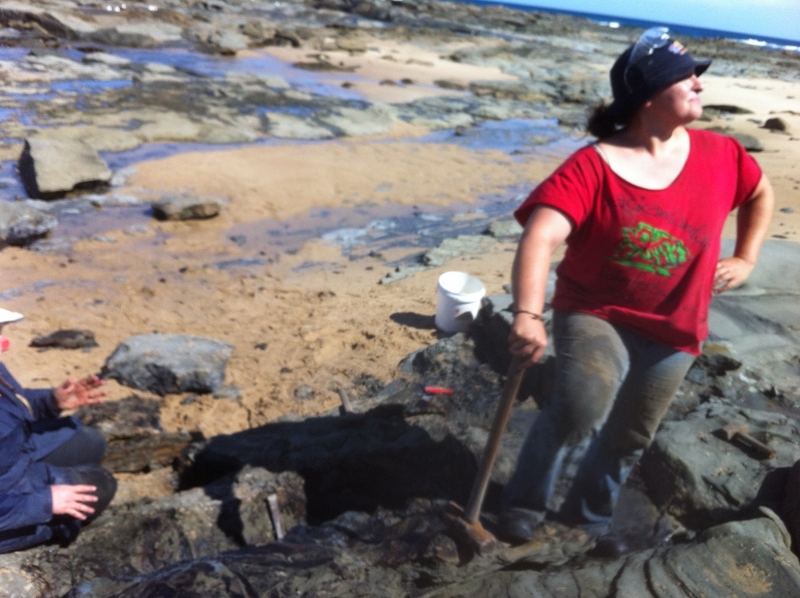 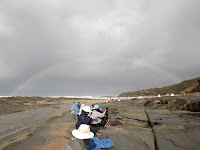 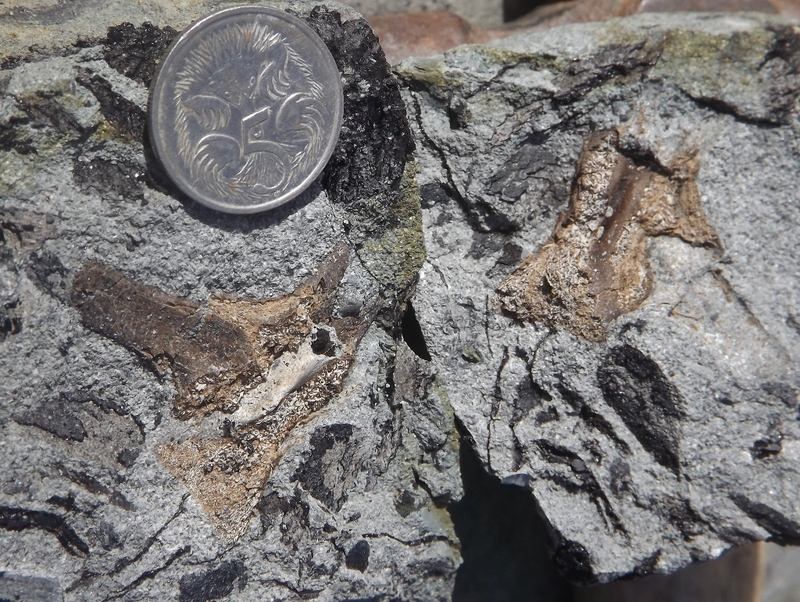 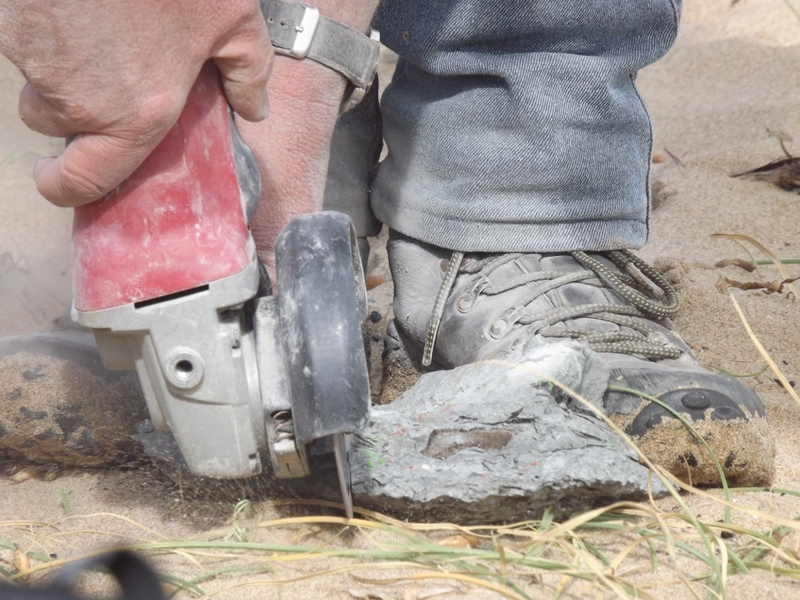 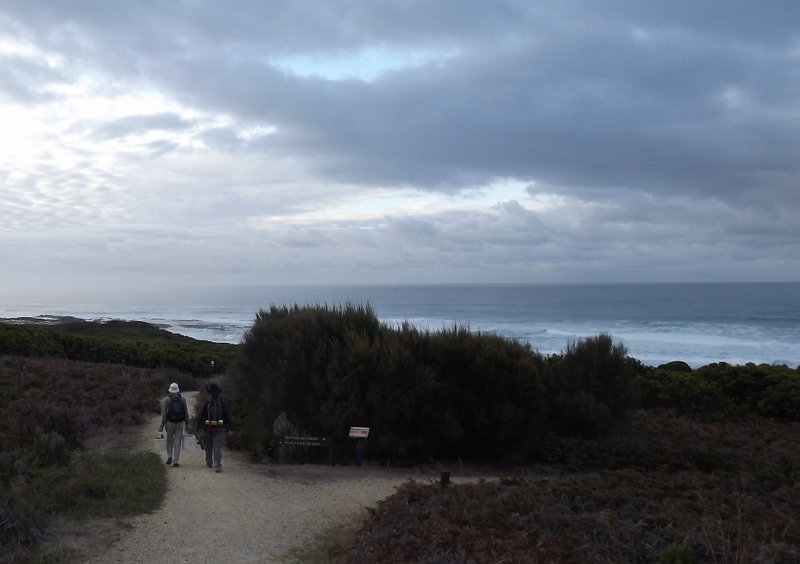 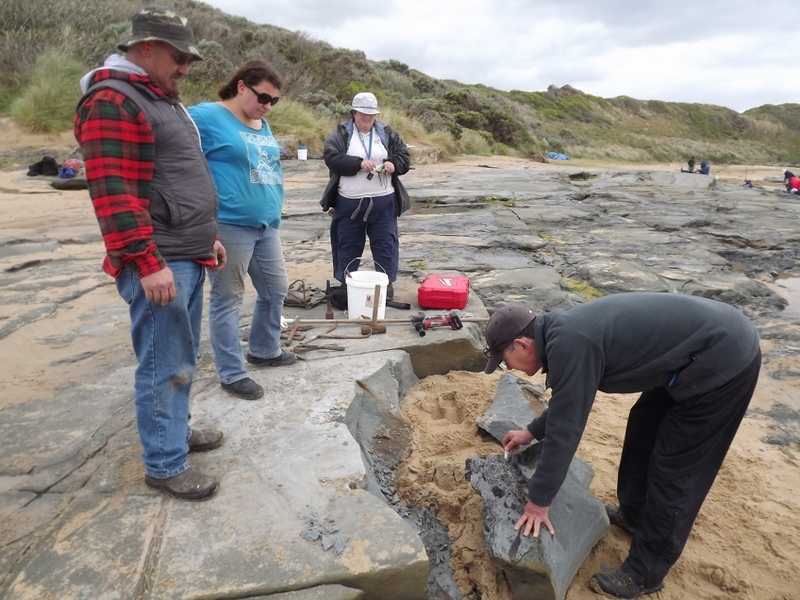 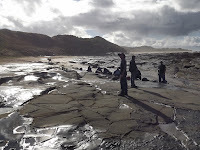 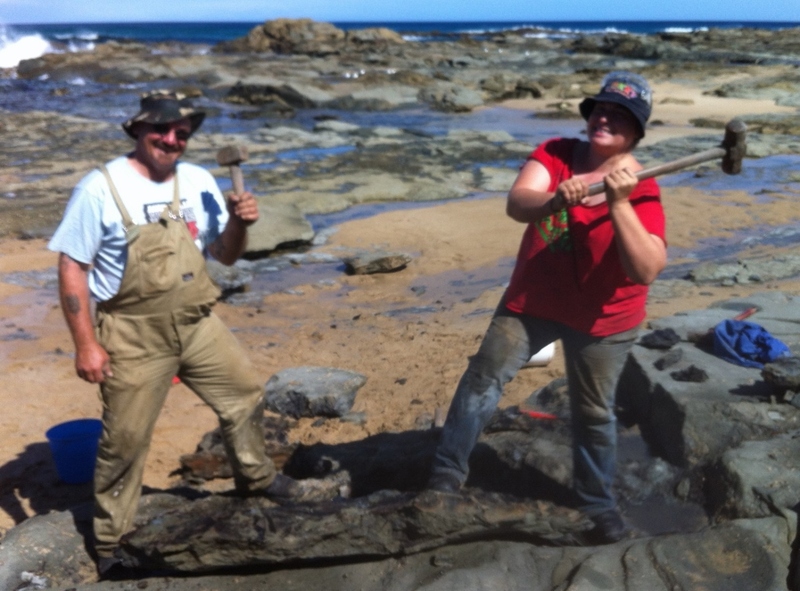 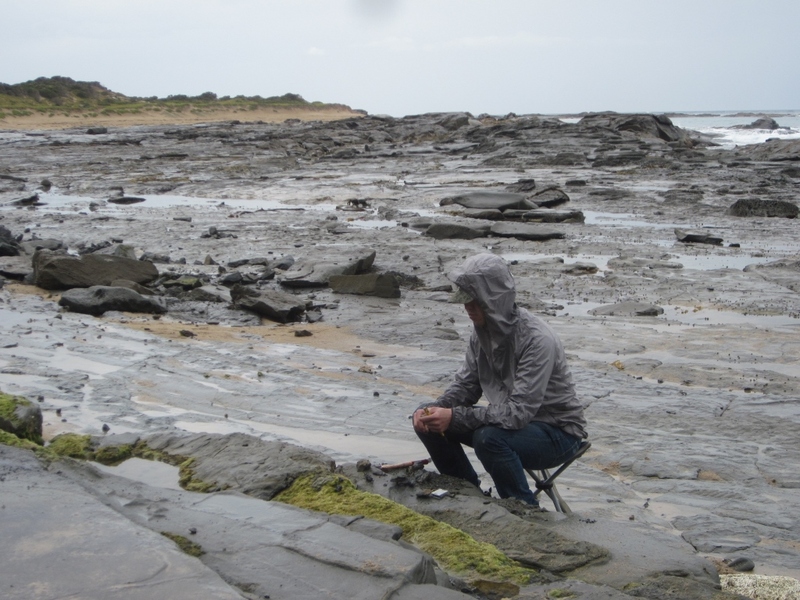 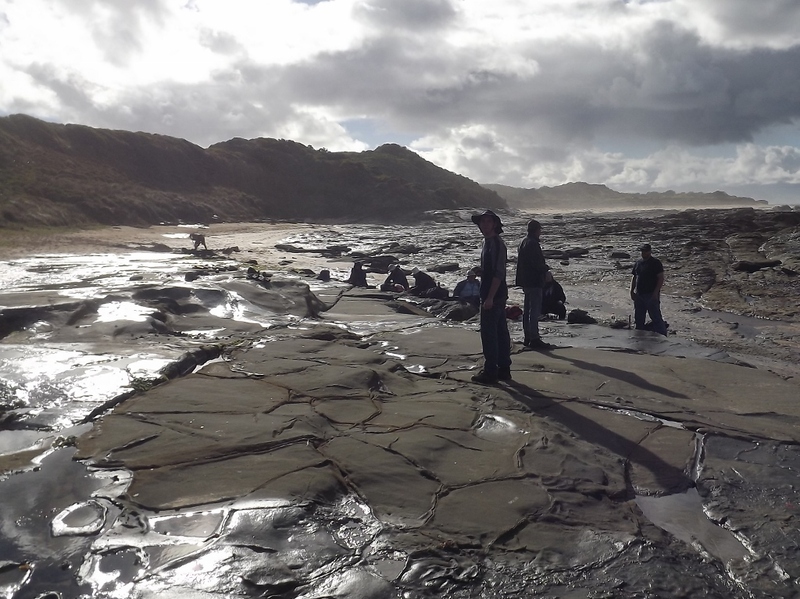 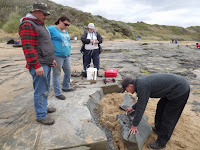 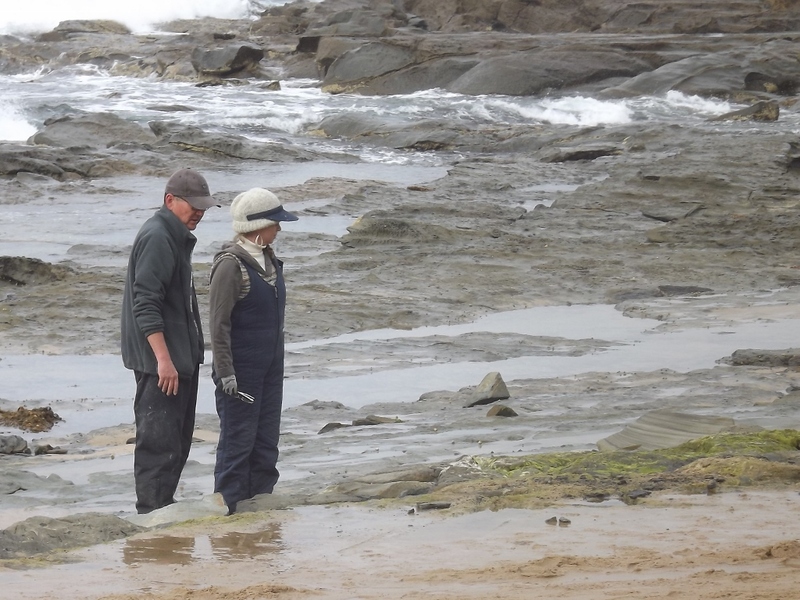 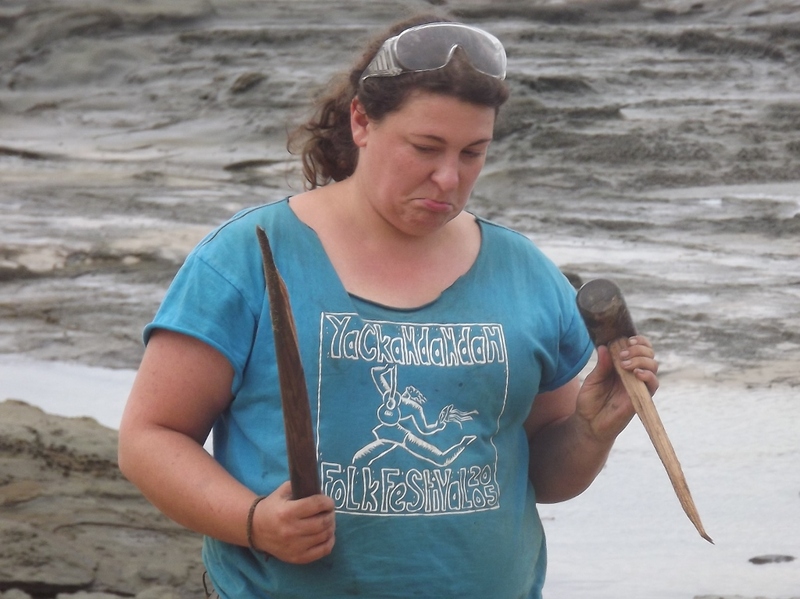 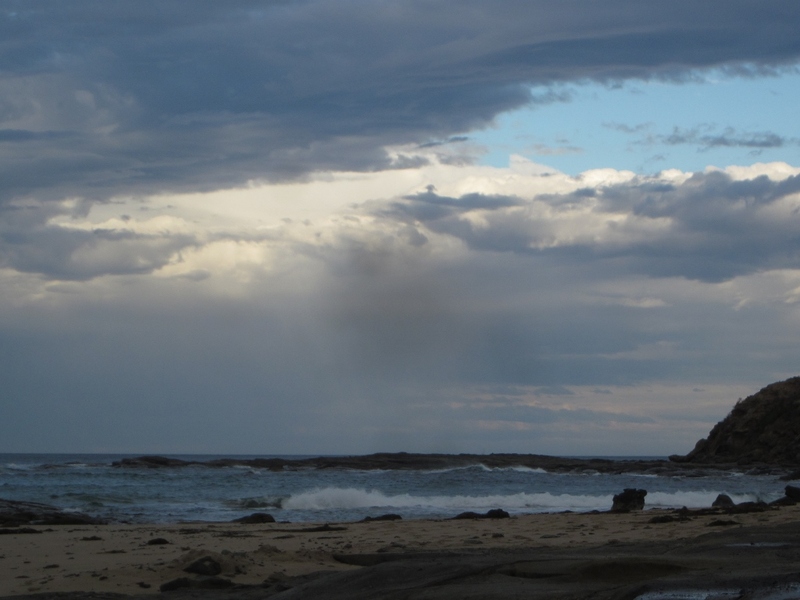 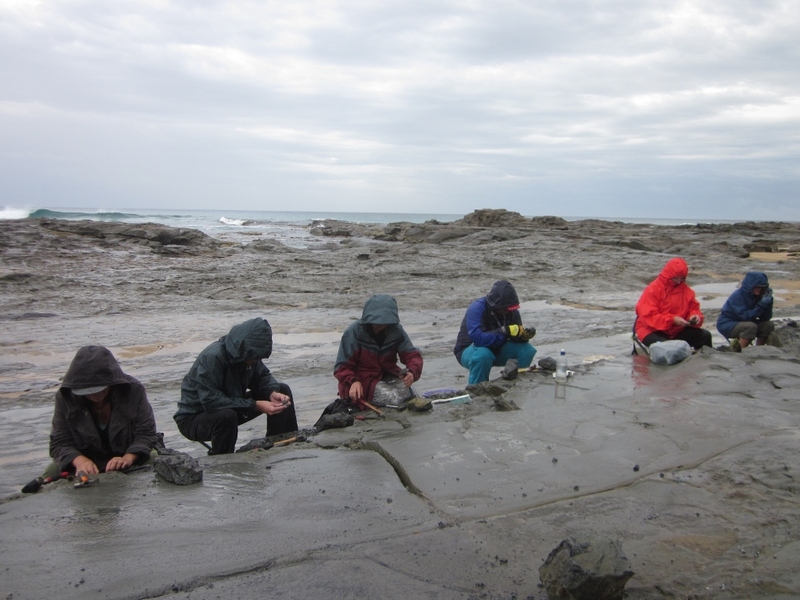 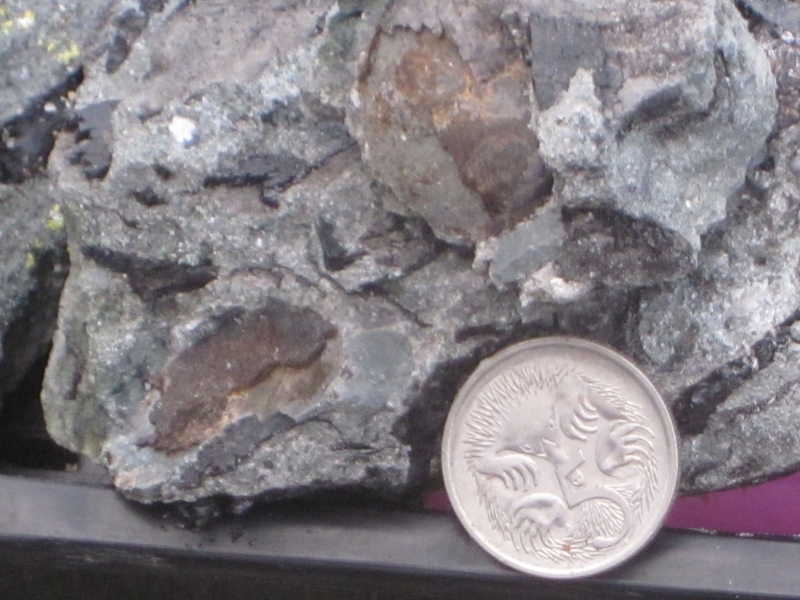 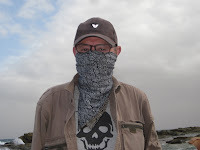 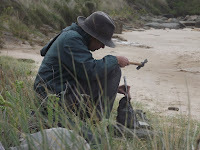 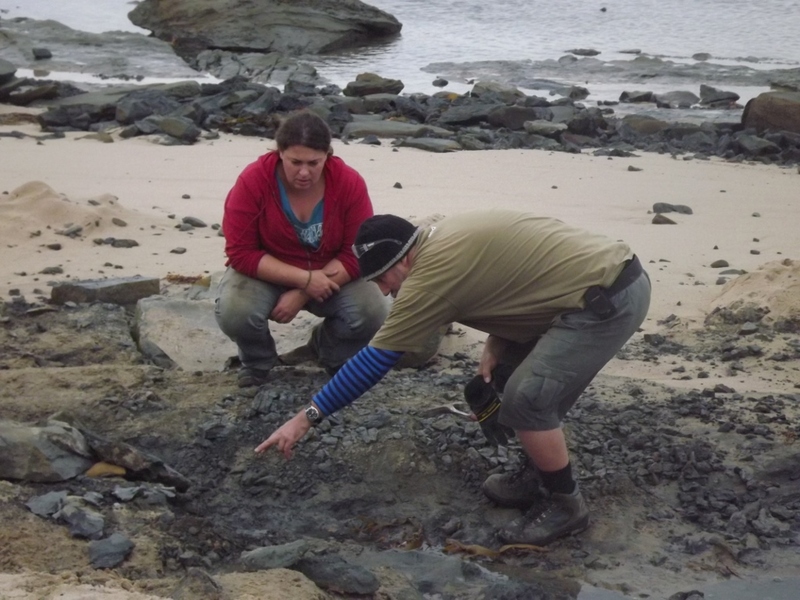 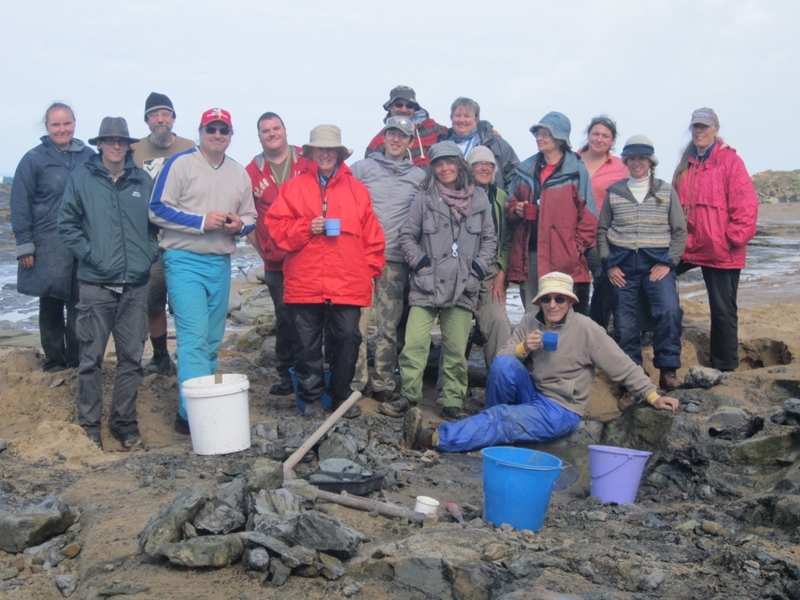 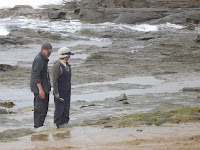 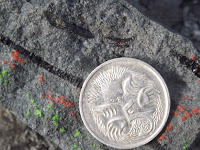 On Saturday Paul got the opportunity to visit the Flat Rocks site near Inverloch, where most of the dinosaur bones from the Strzelecki Group are found. 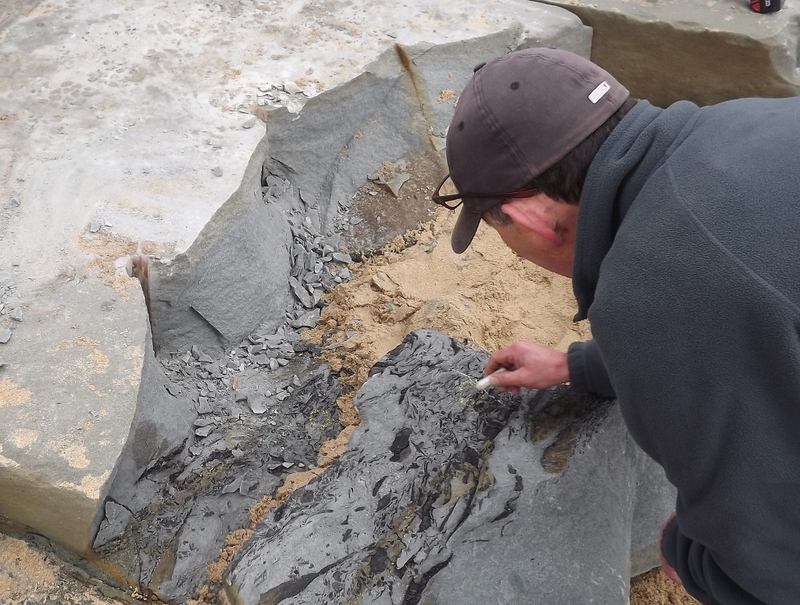 We also took him to where Noddy was found, so now he can visualise the setting when he is writing his paper on our little dinosaur. Paul at the Flat Rocks site, near Inverloch. 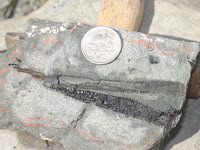 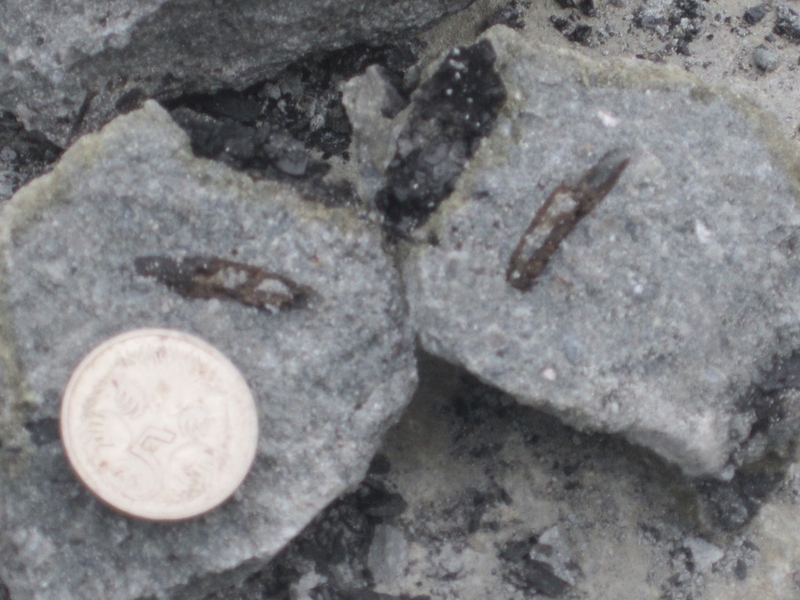 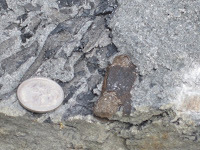 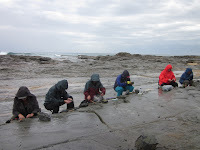 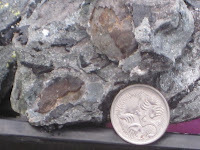 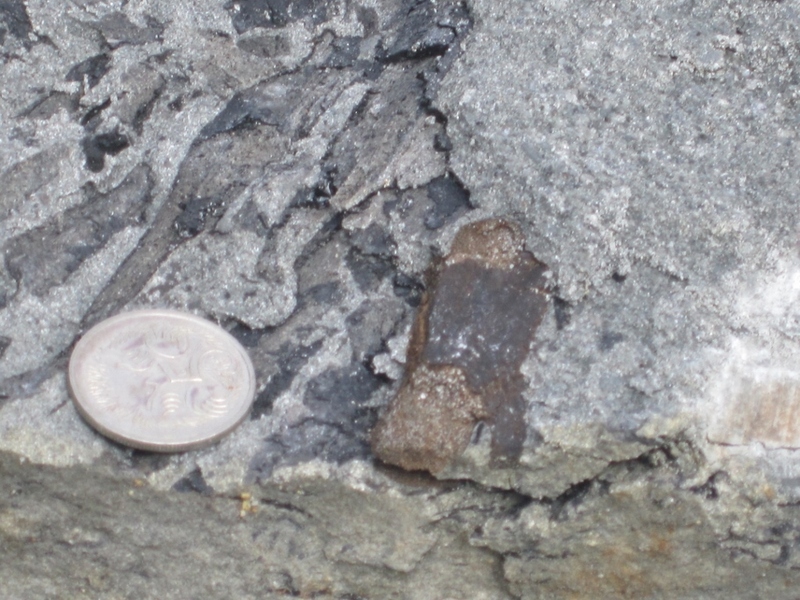 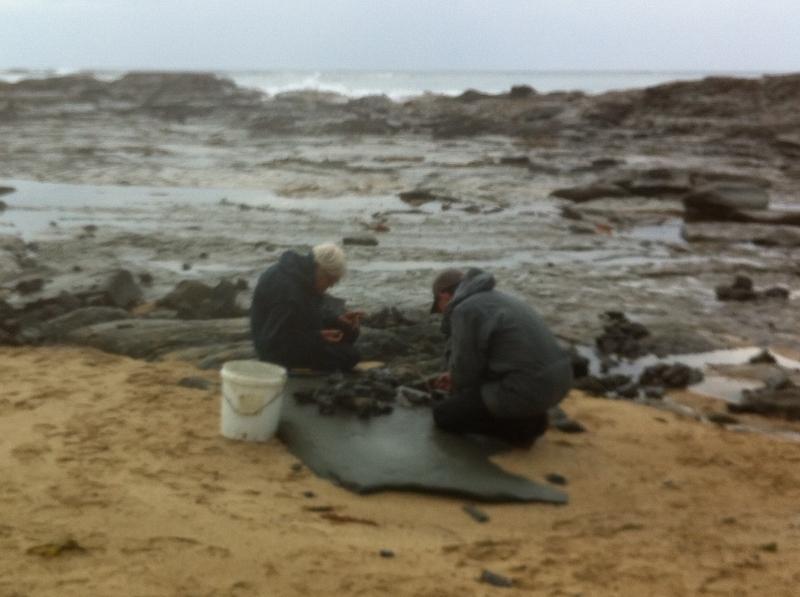 Saturday 16th: 0 fossils (horizontal rain chased us off the beach early). 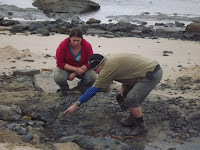 This gives us a grand total of 141 catalogue items for the dig, almost twice as many as 2012. 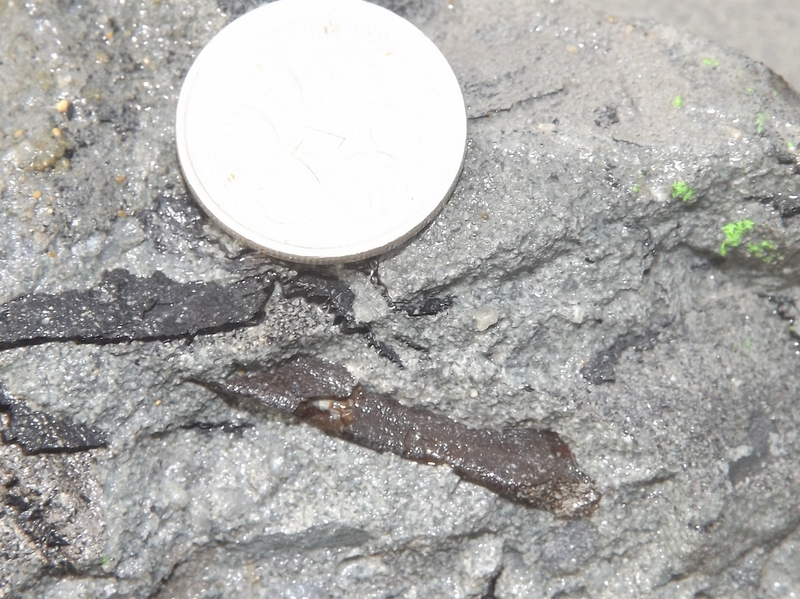 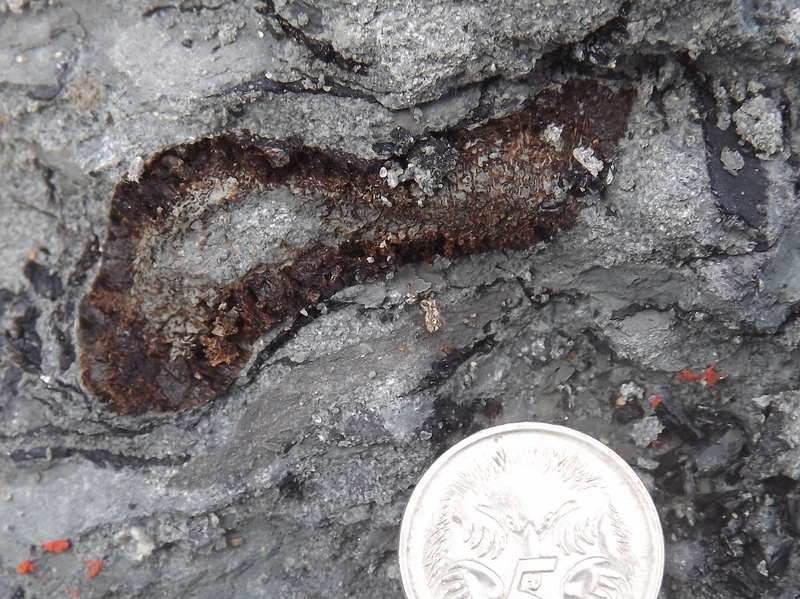 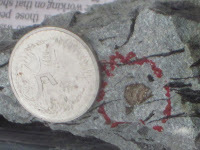 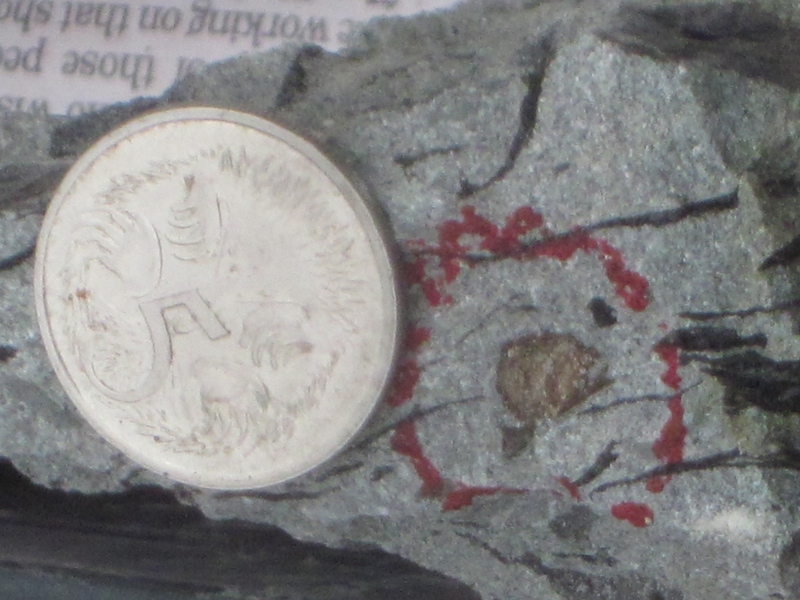 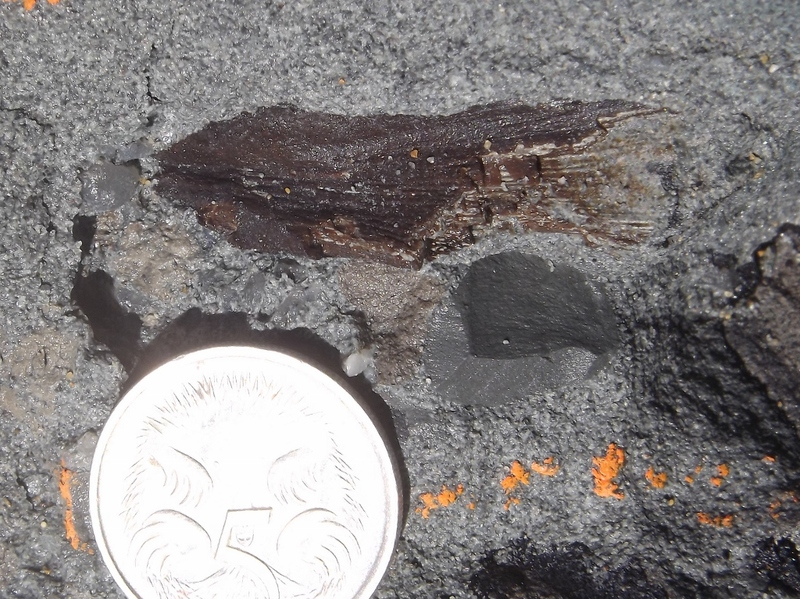 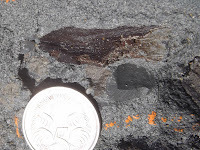 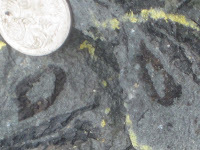 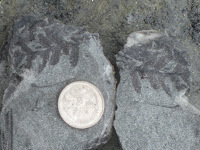 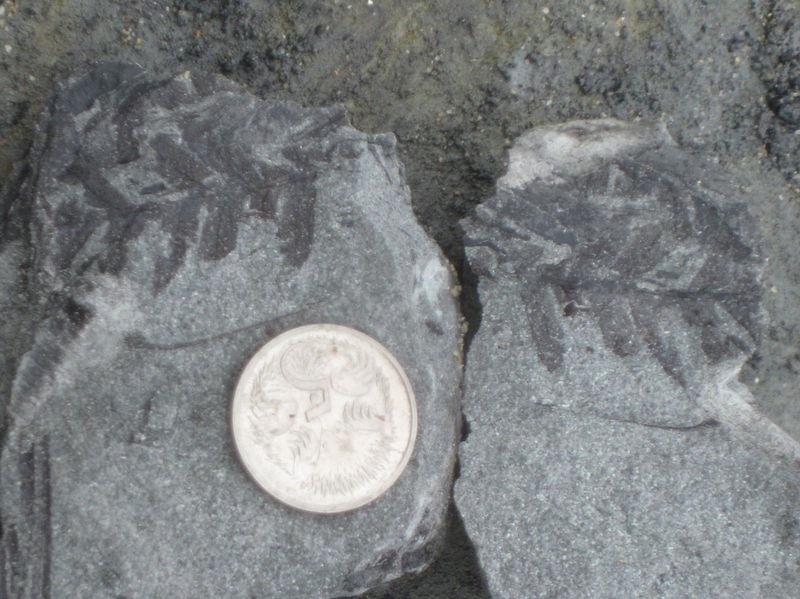 Of course, it's not all about the numbers (we'd rather one spectacular fossil than a dozen undiagnostic scraps). But there are a lot of great specimens in that count, so it's pretty exciting. Toni-Lee finds a lovely vertebra. Dave explains the different parts of the bone. A thin long bone from "the hole"
A section of the big bone. 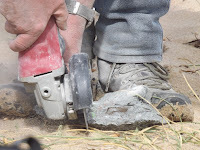 Why are the walls so thick?